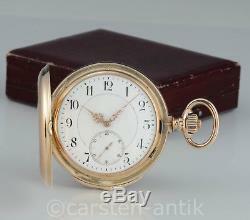 Minute repeater 14k gold LeCoultre Cal. 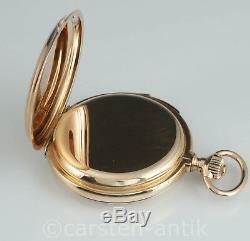 Dresden, minute repeater 14k gold LeCoultre Cal. 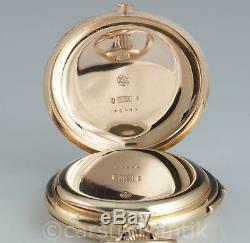 Solid smooth 14k gold case with spring lid in excellent condition and corresponding hallmark 14k on all lids, case marked with "D" in the star, the company stamp of Dürrstein. The condition of the case is almost as good as new. Glass also without traces of age. Three-part enamelled dial with Arabic numerals in good condition, small chips at the rim of the sunken centre of the dial. Three fine Louis XV gold hands, small decentral second. 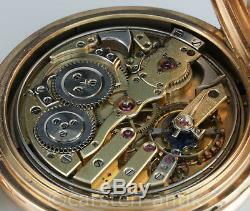 Grained and gilded bridge movement "Erbauche", very elaborate LeCoultre caliber No. 42 precision movement of the finest quality. Finely crafted lever escapement and escape wheel made of mirror-polished steel with counterweight in the form of insect feelers. Movement with two screwed chatons. 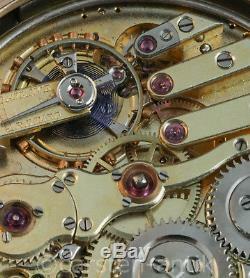 Large bimetallic balance wheel with screwed gold weights and blued Breguet overcoil Polished and bevelled steel parts. Wolf toothed winding wheels, crown wind. 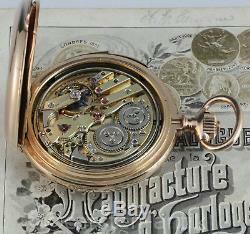 Minute repeater with 2 hammers on two tone springs with clear, loud sound. Triggering of the repetition by using the slider at the edge of the case. The clean movement runs perfectly. 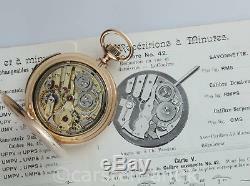 42 is shown in LeCoultre's 100th anniversary catalogue on page 15, from 1903 see photo. The catalogue is not part of the offer and is for illustration only. The watch is in very good overall condition. Diameter without slider 56mm, 20lines, Weight 135g. 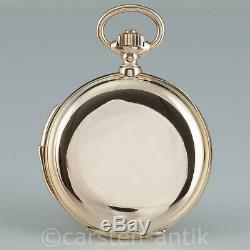 This exquisite pocket watch comes from a series of complicated watches that were produced at the end of the 19th century for the German market. At the beginning of his career, Johannes Dürrstein worked together with the wholesaler Ludwig & Fries; in 1874, however, together with his brother Friedrich, he founded his own company, Dürrstein & Co. In Glashütte, which traded in Swiss watches and watches by A. 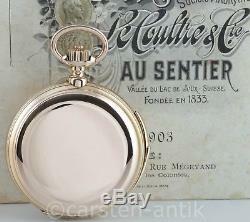 He built up a trading network in Europe and took over sole distribution from Adolph Lange in Glashütte. Almost 20 years later Dürrstein founded the "Uhrenfabrik Union" in 1893. The watches manufactured there were of outstanding quality and could be equipped with high-quality complications of any kind on order. 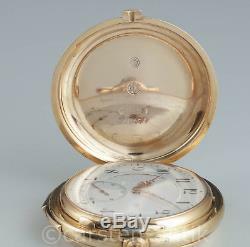 The range included pocket chronometers, tourbillons and perpetual calendars and usually had a movement certificate from the Hamburg Observatory. Dürrstein always tried to satisfy his customers' desire for high quality timepieces and therefore mostly used first-class Swiss movements in his cases in order to sell the finished watches to his customers. Louis Audemars as well as Audemars Piguet were important suppliers of raw movements to Dürrstein; but Dürrstein also supplied LeCoultre from Sentier, many of them with extraordinary complications. Brunner, Christian Pfeiffer-Belli and Martin K. Wehrli provide interesting details and background knowledge on this business relationship and the corresponding watches on pages 52 to 55 in their book "Audemars Piguet". Sehr schön / very nice. The love for old things has kept me working as an antique dealer for over twenty-five years. Originally born in Denmark, I have been living in Berlin for a long time. Always on the search for small and large treasures, the quality and the high craftsmanship of the individual pieces mean a lot to me. A fast, customer-friendly and uncomplicated process is particularly important to me. I wish you a lot of fun while browsing, should you have any questions, do not hesitate to contact me carsten berger. 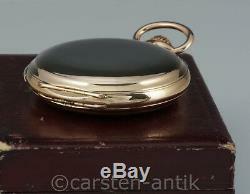 The item "Dürrstein & Co. German minute repeater 14k gold LeCoultre Cal. 42 movement 1890" is in sale since Tuesday, October 30, 2018. 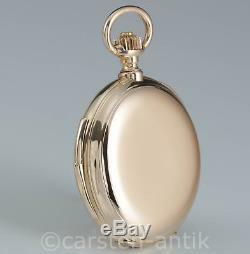 This item is in the category "Jewelry & Watches\Watches, Parts & Accessories\Pocket Watches\Antique".antik" and is located in Potsdam.